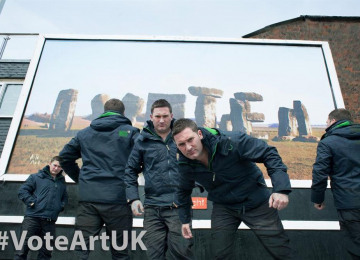 Vote Art was established ahead of the 2015 General Election. 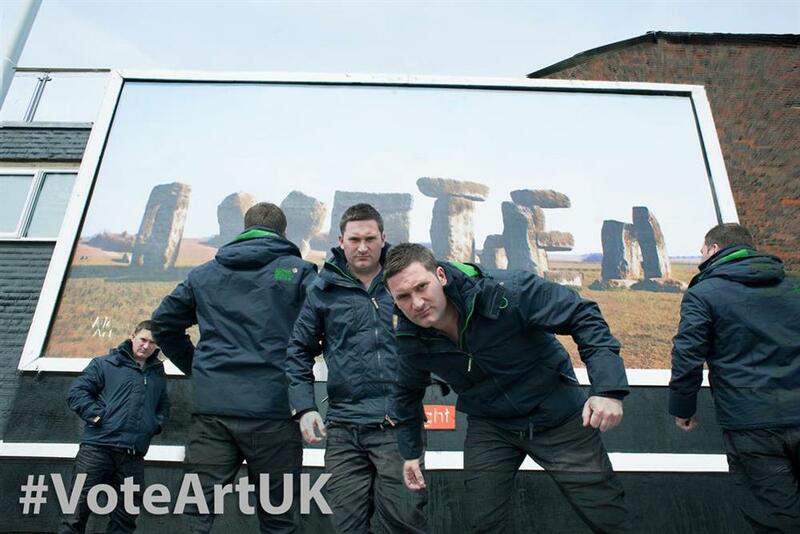 It is a project that invites artists to create new artworks that investigate political themes and places these artworks on billboards. 1. 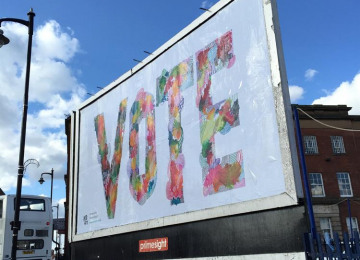 Commission five artists to create new artwork inspired by the London elections that will be placed on billboards around London. 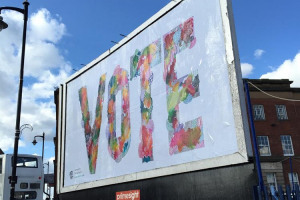 This includes placing work by Lewisham resident & Turner Nominee, Mark Titchner on a billboard site in the borough. 2. 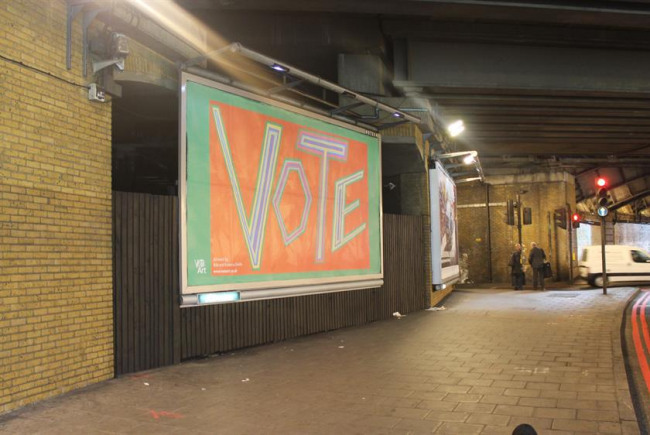 Run a London wide competition to find a new artwork by a first time voter (aged 18-23) who will receive a cash prize of £500 and have their work exhibited on a billboard site. 3. 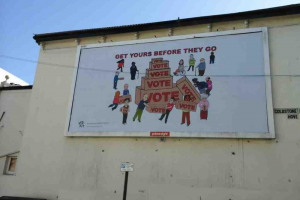 Host three events at Goldsmiths University including a question and answer session with the selected artists; Screening of Bob & Roberta Smith film documenting his political campaign against Michael Gove followed by a question and answer session; plus a debate on artwork and censorship. If our fundraising is successful the London Borough of Lewisham will be the focal point of Vote Art London. All the money that we will raise through this scheme will be used in the borough and directly benefit Lewisham residents. 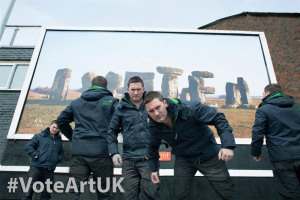 Recent events in the UK have prompted a renewed interest in politics and the role that art plays. We are looking to keep the conversation going by brining work into the public domain and hosting events that will encourage people to debate arts and the democratic process. We also believe that people should have access to the arts and sometimes galleries can appear as intimidating venues. By placing work in the public domain we are able to break down the boundaries between contemporary arts and the general population. We also hope through this project that people to recognise the creative wealth in Lewisham and visit the wonderful gallery spaces (they are really not that scary at all). 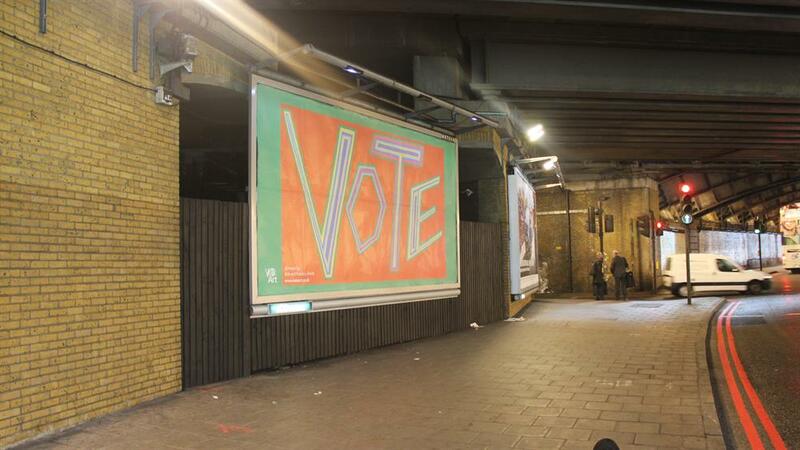 We hope to bring a lot of press interest to Lewisham in the run up to the London elections. 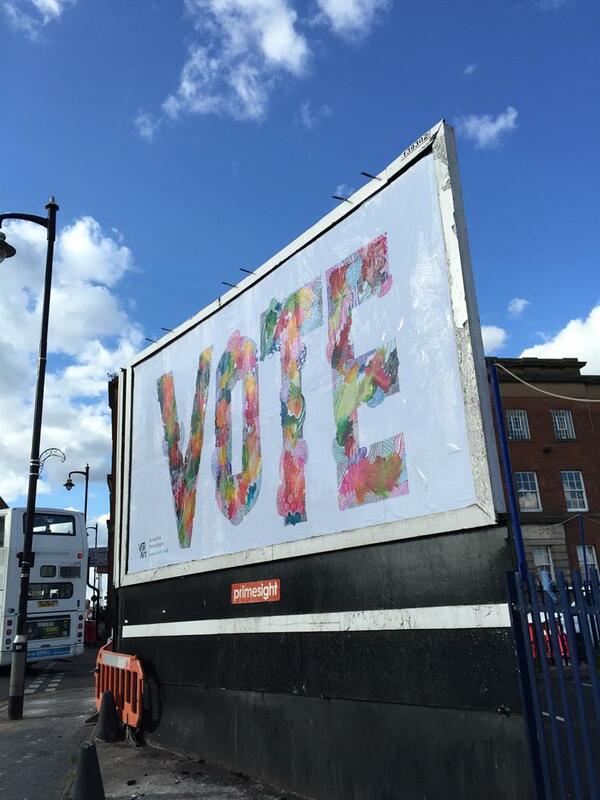 During the 2015 campaign we gained widespread national, specialist and regional press coverage including features in The Independent, BBC Arts, TimeOut, Monocle 24 and Apollo. We are looking to raise £3,100 through this programme to support the programme in Lewisham, but….. 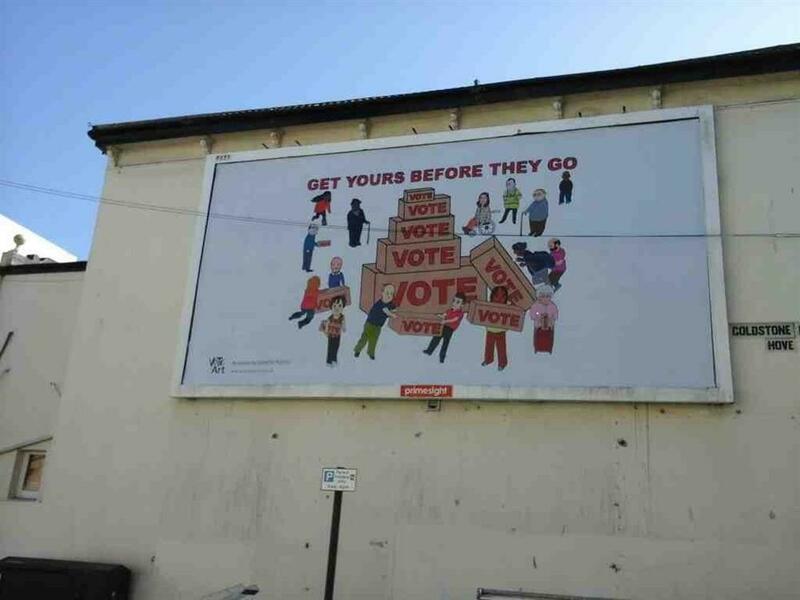 If we raise an additional £500 we will put up work on an additional billboard site in the borough, if we raise an additional £2,000 will put up all five works in Lewisham. 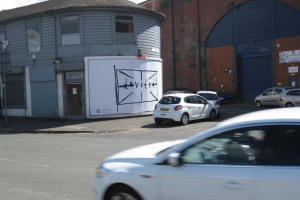 We want this to be a participatory project and want people suggest sites where we can place Mark Titchner’s work. 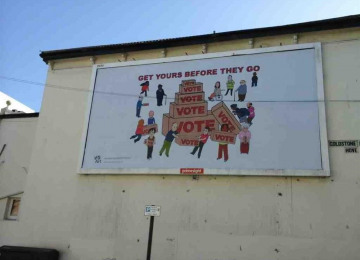 So if there are any billboard sites you think would work, let us know. We also want people to register there interest the debate we will hosting, which will be free to attend for anyone who donates. Project Delivery Manager: Matthew Couper Ltd The Project Delivery Manager takes legal responsibility for receiving and spending the funds raised and ensuring the project is delivered.